Can Angela Merkel make the case for Germany to lead a deeper European integration process? Can Merkel make the case for a deeper European integration process? 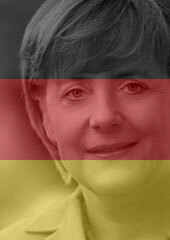 Mrs. Merkel must, and will, make the case for a truly historical transition toward a deeper integration process. Merkel and Schaeuble must be prepared to jump over their party's shadows to accomplish history-making reforms, much as Schroeder did. The big beneficiary of Mr. Schroeder's out-of-character and therefore fortunate act of political courage was Angela Merkel. A key ingredient of Germany’s success in today’s increasingly dismal global economic environment was that a former chancellor, Gerhard Schroeder, mustered the courage to jump over his shadow. Thanks to the fact that he, a man of the center-left, was principled enough to launch structural reforms to Germany’s welfare state via the so-called (and aptly titled) Agenda 2010, Germany’s economy is now performing relatively well. Commentators such as the Financial Times’ Martin Wolf had claimed at the time that the German economy would fail due to high price and benefit levels, which the country would not be able to reduce. As a consequence, they argued, it would catapult itself out of a competitive world market. Things have turned out differently. Although controversial, Schroeder’s historic achievement was to bring German unemployment benefits down to the American level. The fact that Germany’s unemployment rate, long an albatross around the country’s neck, is now at the lowest level in two decades (and in line with U.S. levels during good economic times) proves the architects of the project right. The big beneficiary of Mr. Schroeder’s out-of-character and therefore fortunate act of political courage was Angela Merkel. She has benefited from her predecessor’s righting of the country’s economic ship not only during her first term in office, but until today. However, now she faces a similar test of political courage. Just as it was a test of character for Schroeder and his Social Democratic Party (SPD) to trim the welfare state, so it is now a test of character for Mrs. Merkel and her Christian Democratic Union (CDU) to accomplish the rightsizing of the nation state. While in a completely different domain, that is a challenge on par with what the SPD had to accomplish. Basically, the CDU’s voter base consists of proudly patriotic people. But rather than bask in the illusory glory of Germany doing marvelously, thank you, Mrs. Merkel has to move her base to accept that, in the end, Germany does have to provide a significant back-up mechanism for Europe. Making the case for sharing a nation’s wealth with others is certainly no easy task. But if she is up to the historical task put squarely before her, then the CDU under Merkel and Schaeuble, her powerful finance minister, must act accordingly, in the interest of Germany and the future of Europe. They, too, must be prepared to jump over their party’s shadows to accomplish history-making reforms comparable in scope to those the SPD made under Schroeder. The political outcome of Mr. Schroeder’s maneuver was tantamount to committing political harakiri. His party could not bear the internal tensions resulting from reforming the welfare state. In the end, for all his political courage, he was not re-elected. In their own minds, Merkel and Schaeuble are certainly more demanding of themselves in terms of character and personal integrity than Gerhard Schroeder ever was. That augurs well for their effort to move a quite nation-state-minded party to supporting the cause of pan-Europeanism. A more cosmopolitan Germany certainly needs for this curious pair, erstwhile bitter intra-party rivals, to succeed. Based on this analysis, an interesting secret of Germany’s competitiveness emerges, one that is not based, as is always assumed, on purely economic factors. As it turns out, the political competitiveness of the system was, and is, at least equally important. What one might call the new German dialectic describes a rather fortitudinous process where, precisely at the times when fundamental questions had to be addressed, not only were politicians in power who were prepared and able to deal with them. Ever more fortuitous was the fact that, in the two most recent, most difficult circumstances, it was precisely the party that found itself in government that, if in opposition, would had been dead-set against undertaking that specific reform measure. Just imagine the firestorm the German unions would have unleashed against the CDU had it been the one to implement the structural reform package called Agenda 2010. The beauty of the political dialectic governing Germany is that it is now the CDU that must act in the overall national interest by overcoming the overly nation-state-oriented thinking in its conservative wing. Conservatives cannot continue basking in self-satisfaction at the good things the EU delivers to Germany’s balance sheet, while refusing to accept any debits. That is why Mrs. Merkel has quite a task ahead of her. She must, and she will, make the case for a truly historical transition toward a deeper integration process. For Europe’s most powerful country economically and socially, that is no small task. But the inherent beauty and effectiveness of Germany’s cross-party dialectics greatly facilitates her making this case to her doubters.